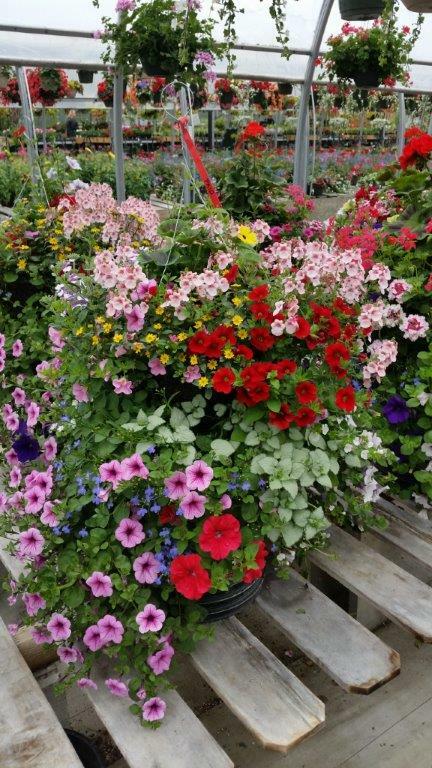 Our hanging baskets come in a huge variety of sizes, from small apartment size to extra large ones for your home or corporate sales for your business. We have a large variety of different types of baskets; some that require more sun or more shade and a wide selection of different types of flower and plants including fushia, begonia, moss and mixed. Our specialty basket is the Large Moss Baskets which are typically 14 inches but we can do larger if you wish and we will also do custom baskets. So many different designs and varieties so make sure you allow yourself enough time to explore our huge greenhouse to see them all! you can even learn how to make your own Hanging Moss Basket at our workshops! An example of a full grown Hanging Moss Basket!